This month twenty Tibetan Buddhist nuns are making history as they take their fourth and final round of examinations for the Geshema degree. Those who pass will receive their degrees in December 2016 from His Holiness the Dalai Lama at a special ceremony in India. The Geshe degree (Geshema for women) is equivalent to a Doctorate in Buddhist Philosophy and is the highest level of training in the Gelugpa school of Tibetan Buddhism. A Geshema candidate on day 1 of the Geshema examinations being held this year at Geden Choeling Nunnery in Dharamsala, India. Photo courtesy of Venerable Delek Yangdron. 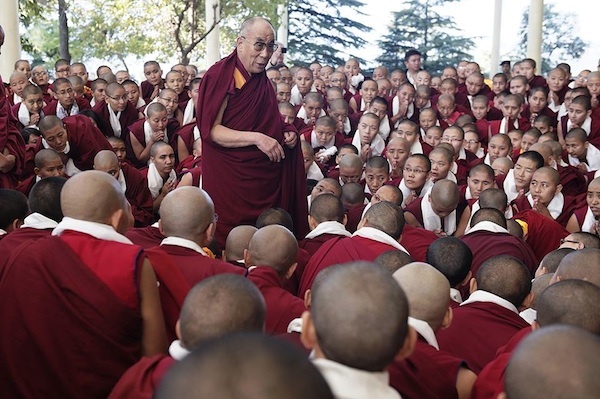 Once only open to men, the opportunity to get the Geshe degree was opened to women in 2012. The Geshema examinations represent a huge milestone for Tibetan Buddhist nuns and this batch of 20 nuns will be the first Tibetan women with this highest degree in the history of Tibet. This entry was posted in Buddhist Nunneries, Dharamsala, Dolma Ling Nunnery, Events, Geshema, News and Updates, Nuns education and tagged Buddhist education, Geshema, Geshema degree, Geshema exams, Tibetan nuns on May 5, 2016 by Tibetan Nuns Project. Some of our most popular items in the Tibetan Nuns Project online store are our malas or Buddhist prayer beads. The Tibetan Buddhist nuns at Dolma Ling Nunnery and Institute near Dharamsala, India make our long malas and bless both the long and wrist malas. A selection of the Tibetan malas made and blessed by Buddhist nuns and available through our online store. Mala is a Sanskrit word meaning “garland”; in Tibetan, a mala is called threngwa. Malas are used to keep track while one recites, chants, or mentally repeats a mantra or the name or names of a deity. Malas are similar to other forms of prayer beads used in various world religions and they are sometimes called the Buddhist rosary. They are employed to focus one’s awareness and concentration during spiritual practice. Mantras are spiritual syllables or prayers and are usually repeated many times. In Tibetan Buddhism, one mala constitutes 100 recitations of a mantra. There are 8 additional recitations done to ensure proper concentration. One holds the mala with the left hand and begins to recite from the guru bead, clockwise around the mala. This entry was posted in Dolma Ling Nunnery, Tibetan Nuns Project Products and tagged long malas, mala, mala bags, malas, mantras, Tibetan Buddhism, Tibetan nuns, Tibetan prayer beads, wrist malas on January 20, 2015 by Tibetan Nuns Project. At the end of October 2013, thanks to the generous support of Tibetan Nuns Project donors and to the hard work of the nuns themselves, the construction, furnishing and landscaping of 8 permanent retreat huts at Dolma Ling Nunnery and Institute near Dharamsala, India was completed. Retreats are a core part of Buddhist practice and these huts will allow the nuns to develop their own insight and knowledge in complete privacy. This is the first time that retreat facilities have been available at Dolma Ling Nunnery, home to over 230 nuns. The nuns plant bamboo near the retreat huts. This entry was posted in News and Updates and tagged Buddhist nuns, Dolma Ling Nunnery, paramita of generosity, retreat huts, supporting nuns on retreat, Tibetan nuns on November 6, 2013 by Tibetan Nuns Project. This entry was posted in Events, News and Updates, Nuns education and tagged bhikshu, bhikshuni ordination, Buddha, Buddhist debate, Buddhist education, Buddhist retreats, Geshe, Geshema, Geshema exams, His Holiness the Dalai Lama, Jang Gonchoe debate, Pali tradition, Tibetan Buddhist debate, Tibetan nuns, vinaya on November 3, 2013 by Tibetan Nuns Project. On October 31, 2013 nine nuns from 7 different nunneries formally completed one and a half month’s of nursing training at the Tibetan Delek Hospital in Dharamsala, India and were honoured at a special closing ceremony at the hospital. The participants with health secretary Sonam Choephel Shosur and Mr Dawa Phunkyi, member of parliament and chief administrator of Tibetan Delek Hospital. The training was organised by the hospital as part of its programme to improve public health. The nine nuns taking part in the training came from Dolma Ling, Gaden Choeling, Jamyang Choeling and four other nunneries. This entry was posted in Events, Nuns education and tagged Dharamsala, nursing training for nuns, Tibetan Delek Hospital, Tibetan nuns, Tibetan Nuns Project on November 2, 2013 by Tibetan Nuns Project.